It’s been a long time since I’ve written a manga review, so forgive me if this one turns out to be crappy. I really don’t know where to start on this one. Let’s just say when I bought it, I didn’t know what to expect. Red-haired Princess, obviously brings to mind AnS. It was a comparison I was ready to make as I read “Dawn of Arcana”. I’d say about 5 or 6 pages into it, I realized that this was no clone or relative of AnS (Actually, it’s more along the lines “Zettai Heiwa Daisakusen”). This is a truly strong red-haired princess, and her prince, though weak now, is no puss. After that, AnS flew out of my mind and I was swept away with “Dawn of Arcana”. First a short summary: In order to bring peace between warring countries, Princess Nakaba of the northern country of Senan marries Prince Cesear of the Southern country of Belquat. Princess Nakaba has red-hair, the mark of commoner, which has led her to live a life of ridicule. Princess Nakaba is accompanied by her faithful servant Loki, a strong part dog, part man bishie. Of course, the Nakaba and Cesear don’t like each other at first and one of their fights, involving a knife and sword, degenerates into dangerous foreplay — ahem… Heheheh…ah yeah…I don’t want to give anymore away, because this is something you have to read and let yourself get carried away with. 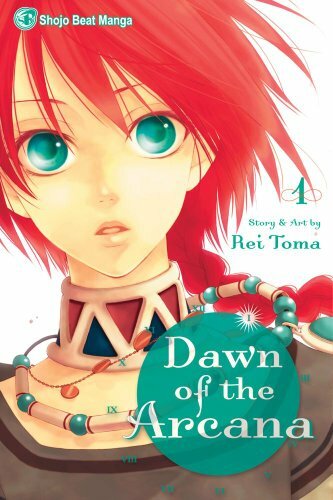 Link to purchase “Dawn of Arcana” Volume 1 from the Omari’s Sister Amazon store. Some parting thoughts: I don’t know whether this series opens the door for series like AnS and ZHD to get licensed. I think in comparison, AnS is bland and I wouldn’t put it out now because the comparison is too easy. Reading something like “Dawn of Arcana” really highlights some of AnS’s story and character weaknesses. ZHD, on the other hand, is similar to “Dawn of Arcana” in premise and character strength, but with less bite. ZHD has slapstick comedic elements that sets it apart and keep the story from going too dark. I could see ZHD being a great companion to “Dawn of Arcana”. As for AnS, I’ve been thinking a lot about it lately. I’m glad the pirate arc is over. I thought pirates would be cool, but it felt to me as though Sorata didn’t have the same love of pirate romance as other mangaka. AnS is much better when it sticks to character interactions and slice-of-life themes. That said, I’m happy AnS has returned to the spirit of its earlier chapters, and I look forward to the deepening of Zen and Shirayuki’s bond.